* 303 protected vinyl restores lost color and luster. Makes faded vinyl look like "factory new" again... and with regular use keeps it that way. * 303 protected vinyl treated vinyl stays cleaner longer, cleans up easier. Easy application. Spray on, wipe dry. Simple Cleaning: Keeping vinyl clean is an important part of routine maintenance. Dirt acts as an abrasive and can also wear out the thread in seams. Mildew grows on damp, dirty vinyl. Protecting Vinyl Using the wrong vinyl "protectant" product is worse than using no vinyl treatment product at all! Avoid vinyl treatment products that contain any type of oil, have an oily or greasy feeling, contain petroleum distillates or leave a coating that dries like wax. If a product label says "flammable or contains petroleum distillates", do not use on vinyl. 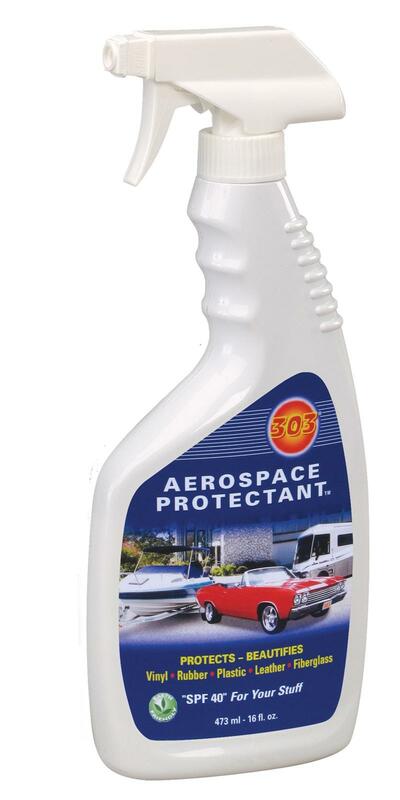 303 Aerospace Protectant ... is your best choice for vinyl care. Specifically developed as a UV screening protective treatment for aerospace and aviation applications, "303" provides all the protective features necessary for maintaining vinyl. "303" is the world's most powerful UV screening treatment for vinyl. Regular use prevents UV fading and degradation. It truly is like "SPF 40 Sunscreen ... For Your Stuff". "303" protected vinyl repels dust, dirt, oils, tree sap and stains to maintain surface integrity. "303" restores lost color and luster. Makes faded vinyl look like "factory new" again... and with regular use keeps it that way. "303" treated vinyl stays cleaner longer, cleans up easier. Easy application. Spray on, wipe dry. Treat both sides of clear vinyl with "303 Aerospace Protectant. Spray on, wipe completely dry. Use only clean, absorbent non-abrasive, cotton cloths. "303" is the only effective UV screening treatment for vinyl. "303" leaves an optically enhanced finish for clearer vision. "303" repels smudges, dirt and dust, stays cleaner longer, cleans up easier. "303" helps protect against scratching. "303" treated vinyl repels dirt, dust and other mildew-loving contaminants. "303" also repels water so treated surfaces dry quicker. This means mildew is much less of a problem when you use 303 Aerospace Protectant. "This product works very well. Our spa cover had faded a lot in the 2 years we have had it, but this product brought it back!"